Oh, how it pains me to hear those well-meaning, little words. Anthropologist-minister, polyglot, proud mother of a child with disabilities, writer, Christian, lifelong learner. I remember the months before my daughter, Lucia, was born -- how people from all walks of life would look knowingly at my pregnant belly and give me heaps of unsolicited advice. A lot of times it was really annoying, because even though pregnancy and birth are fairly universal experiences, it's hard to generalize. But their excitement, their anticipation, and their joy was contagious: there's nothing like the expectation of a new baby to get people dreaming and scheming with abandon, and so there was something lovely about all their words, fumbling and intrusive though they could be. These days, now that Lucia is almost 2 but cannot walk, talk, or move purposefully, people still gaze knowingly at us, but their smiles quickly turn to quizzical looks when they realize she's not really a baby -- she's a toddler with a progressive, terminal genetic disease of the brain. And when they ask what's wrong with her or what condition she has, there's an incredible series of misrecognitions and disconnects: her disease is so rare, one in a million, 200 to 300 cases reported worldwide, that no one has ever really heard of it. So the disease, Aicardi-Goutieres, confounds rather than explains, and its symptoms -- seizures, feeding through a tube for a lifetime, progressive brain damage, and often death in early childhood -- inspire fear and pity rather than understanding or connection. When I tell people that Lucia has Aicardi-Goutieres, they always respond with two to three heartfelt words. We are an "I'm sorry" culture. We bump into another person in the grocery store -- "I'm sorry." We inquire for directions -- "I'm sorry, but can you tell me...." Even the semblance of inconvenience is prefaced or buttressed by these efforts to make life more pleasant, to paper over the disconnects, to find a way in and out of our busy lives without too much discord, difference, or distance. I know it's just culture and custom when people instinctively respond by saying "I'm so sorry" regarding my daughter's disability, but it both cheapens and chafes against my experience. When people say they're sorry to hear about Lucia's disability, I'm really not sure I know what they mean. Perhaps they're sorry that she has to suffer pain or medical procedures to stay alive. Perhaps they're sorry that she won't walk or talk or go to college, or that her life will be cut short by all the complications of the disease. 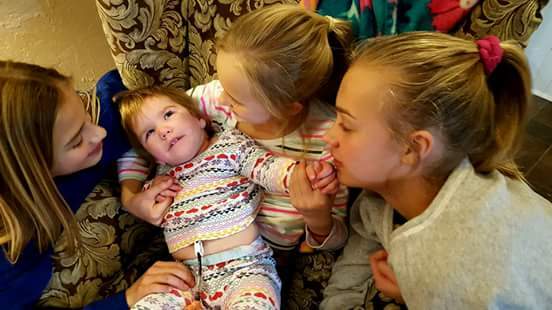 Perhaps they're sorry that we as her parents have to see her suffer, that we have to fight so hard to get the care that she needs, and that sometimes taking care of her is really challenging. I guess I understand most of that. Life with Lucia is hard. Life for people with disabilities is a real challenge in this world. But when people say they're sorry that my daughter has Aicardi-Goutieres, I feel like it also implies that there's been some kind of loss, some kind of inconvenience, great or small, some type of profound unpleasantry which needs to be apologized for. And suddenly that joy that everyone was filled with, anticipating the birth of my child, starts to feel so far away, so carefully and cautiously reserved for whole and healthy children rather than for all life, or for my daughter's life. "I'm not sorry," I've taken to saying. I stare into their wide eyes and I tell them that to me Lucia's life is not a tragedy, that there's nothing to be sorry for. I explain to them that the limits the world sees are not necessarily Lucia's limits but our limits to communicate, to love, to care. And I guess I try to remind them that joy and life and expectation are not perfect or painless or even convenient, but that love is always extraordinary. I try to be me in a world that is always sorry, and I wonder if my little inconvenient words might actually bring some of us closer together rather than farther apart. Lucia with her cousins over Christmas. Photo by Arwin Ray.